EDITOR'S NOTE: This is the 1,500th Emerging Runner post. It all started here. Happy Boston Marathon Day. I grew up in the greater Boston area and have always felt tied to this event. The Boston Marathon used to be held on April 19th (Patriot's Day), which happens to be my birthday. That was, until Massachusetts began observing the holiday and running the race on Mondays. It was great that the Boston Marathon route went right though my hometown, and we could watch the runners go by from a hill behind our house. I never thought about actually running the Boston Marathon (or any marathon for that matter) because it seemed like an impossible thing to do. Even now, the thought of running a full marathon seems abstract and unlikely. Having crossed the line on a couple of half marathons, I cannot conceive of running that distance twice, all at once. It's no longer impossible for me to imagine it, but I'm not willing to commit the time and effort that would be required. I fully admire those who do run marathons, but I'm sticking with halfs. The Jan/Feb issue of Running Times featured a product that runners can use to brag about their marathon accomplishments. 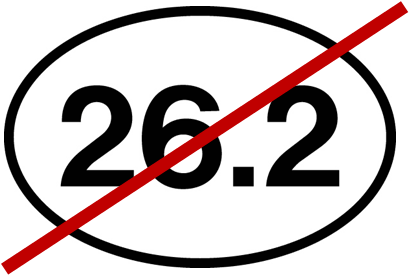 I'm not talking about the ubiquitous 26.2 decal. Apparently anyone can buy one of those, no questions asked. ProvenSport (I'm not including a link because I think this is a stupid idea) will only sell their $7.99 decals to people after they, "...validate every achievement and certify [your] legitimate bragging rights." This, for only $5 more than that unverified 26.2 decal! I know that every runner's motivation is personal and racing supports our self esteem. Those oval race decals are fun, and they don't bother me when I see them on cars. I never question the veracity of the statement, and have never thought once about the owner's possible finish times. Those who need to push the point of broadcasting to the world that they ran a marathon really, really fast probably need more than a decal to address their own self esteem issues. I would opt for facial piercing and reserve your forehead for the possibility of an Ultra. Oh my God! I had a nightmare a couple of weeks ago that Alex Rodriguez made me get facials piercings! I was so upset. I think we'll agree that the the key point here is to never take fashion advice from Alex Rodriguez. ..and the decal above IS fugly. I know. It's almost odd how little thought seemed to be put into the design.